Are you the creative type who loves to do special things with paper, crafts, stationery and scrapbooking? Try using our exquisite embossers and our beautiful designs to make unique Personalized paper, invitations, return address envelopes, napkins, book plates, letterhead, note cards, tags and more! 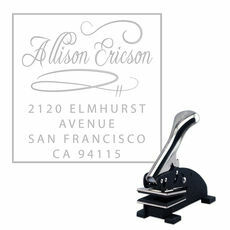 Our charming monogrammed embossers are perfect for weddings, holidays, moving cards, housewarming gifts & special events. Our personalized embossers are available in most shapes and styles including circle, square, round and diamond! We also now offer the ability to upload your own artwork right here! 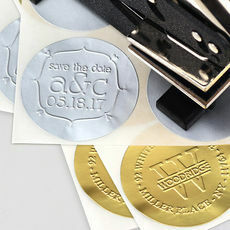 If you have a company logo, a custom wedding monogram, artwork drawn by your children or any artwork that is unique and important to you, upload it now! 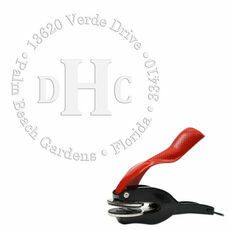 We offer a variety of specialized products from embossers to stampers to stationery and more. Enjoy the uniqueness of your own artwork combined with great quality. You can visit our Customer Supplied Art Boutique for easy ordering and see a variety of products!